Missouri politics was rocked late Wednesday night when Gov. 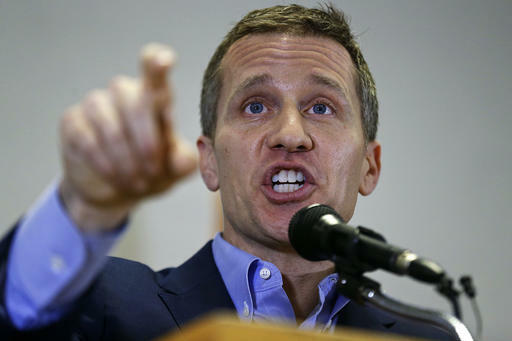 Eric Greitens (R) admitted to an extramarital affair amidst allegations that he blackmailed a woman with a naked photo he took during one of their sexual encounters. The news broke just hours after the Governor delivered his second annual State of the State address. Greitens admitted to the affair in response to a report by KMOV News 4 in St. Louis. He also released a joint statement with his wife Sheena in which the two say they have moved on from the affair. The affair reportedly occurred in 2015, more than a year before he was elected Governor in November 2016. Politicians are frequently able to weather scandals based on extra-marital affairs. But the allegation of blackmail makes the story considerably more serious and politically perilous. According to the KMOV report, the story emerged from the now ex-husband of the woman Greitens was involved with. The husband confronted his wife with his suspicions of infidelity days after the encounter in question and then surreptitiously recorded her confession. Almost three years later he shared that recording a reporter from KMOV. According to the women, Greitens later apologized and said he had deleted the photograph. The woman and her husband tried to reconcile but their marriage collapsed. The husband apparently believed Greitens was still pursuing his wife. It is not clear from published reports why law enforcement would be involved or seeking to speak to the ex-husband. But the threat of blackmail, if proven, could potentially constitute a crime. Other news organizations apparently had much of the information contained in the KMOV report, including the recording of the woman who was involved with Greitens, but did not publish because the woman in question declined to be interviewed. The Post-Dispatch also has possession of the audio and has interviewed the ex-husband. The newspaper had previously decided against writing a story based solely on the husband and the audio recording, because the woman in question has consistently declined to be interviewed. However, Greitens’ public acknowledgment of an affair made it necessary to revisit that decision. Neither KMOV or any of the other publications have revealed the name of the woman who Greitens had the affair with or that of her ex-husband.